The one room in the house that is totally ready for the coming onslaught is the Toddler Girl's room. Eventually, when I get the headboards I have for it refinished and the Toddler Girl learns to sleep in a real bed, it will become the girls' room, but for now The Boy and The Middle Girl share a bedroom. I'm pleased with how the room turned out. It's just as I wanted it. I'm even more pleased, because I found almost all the little decorating stuff on clearance here and there -- even the paint. It's Restoration Hardware's lavendar color, which they sold for $7.99 a gallon when they change to lilac. Other than the Beatrix Potter print on the wall, the paintings are ones I did. Here's a link to all the photos on Flickr. 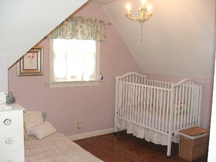 What a pretty little girls' room! And there's my favorite painting on the wall. The chandelier really is the frosting on the cake. So delicate! I wish I had a room that clean and uncluttered. Then we might have a prayer of selling this poor house!